Quinlon Vos is one of my favorite comic character! He is made from a Qui-Gon Jinn Naboo body & robe; classic 8 Obi-Wan Kenobi arms, Ep. 1 Jedi Duel Qui-Gon hands; Ep. 1 Obi-Wan head and Qui-Gon's hair. I boiled and popped all parts. I painted the body and hands before reassembly. I painted him according to the way he looks in the Twilight comic. I dremeled out the face of Qui-Gon leaving the hair only. I then filled off all the hair from Obi-Wan so the Qui-Gon "wig" fit on his head. Before glueing the hair to the head, I painted the "war paint" on Quin's face using the tip of a tooth pick. I then glued the hair to Obi-Wan's head. I used the braid from Ceremonail Leia for the front braid. I used black sculpey to blend all the hair pieces together. I painted the robe dark brown to match the C-8 Ben Kenobi arms and then glued all the body parts together (sans the head). After painting the hair, I glued the head in place. 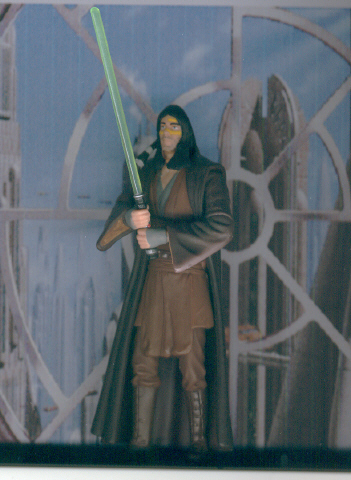 I finished him off with a coat of Testor;s Dull Coat and Qui-Gon's green bladed saber.